KCS Publications uses CrossCheck’s iThenticate software to detect instances of similarity in submitted manuscripts. Your manuscript may be screened for similarity to published material. Authors are required to submit manuscript materials electronically using KCSnet Editorial System (KES) available at http://journal.kcsnet.or.kr/main/j_myjournal/login.htm?qpage=login. Manuscripts should be prepared with one of the following Templates ( Highlights / Communications / Articles / Notes ). It is strongly recommended that all figures and schemes are assembled in a Microsoft Power Point 2003 (or a later version) file. Corresponding author’s name, mailing address, phone and fax numbers, and email address. A statement of the signifi cance of the work. Title and author list. Please consult samples of published papers. Abstract. Article must contain an abstract. The abstract should not exceed 150 words and should state briefl y the purpose of the works, results and conclusions. Communications and Notes do not contain an abstract. Keywords. 2-5 keywords should be included. Introduction. The introduction should state the purpose of the research and should include appropriate citations of previous and relevant works. Experimental Section. The manuscript should provide details of experiments so that the experiments are reproducible elsewhere by readers. Results and Discussions. Only relevant results are to be presented and discussed. Tables. Tables should be numbered consecutively with Arabic numerals and each table should be provided with a descriptive heading, which, together with the individual column headings, should make the table as self-explanatory as possible. Figures. Figures must include appropriate files of original drawings or photographs. Drawings or photographs should be large enough so that after reproduction to a singlecolumn width (8.5 cm) the smallest letter is 1.5 mm. References. All references should be numbered in the order in which they are first mentioned in the text and the complete list of references should appear at the end of the manuscript. Examples for references are given below. 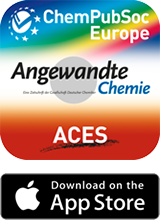 Please consult a current copy of Angewandte Chemie International Edition for specific examples of style and general recommendation. C. Seto, G. M. Whitesides, J. Am Chem. Soc. 1990, 112, 6409. R. Schmid, A. F. McDonagh, in: The Porphyrins (Ed. : D. Dolphin), Academic Press, New York, 1979, Vol. 6, p. 258. Figures, Schemes and Tables. Figures, schemes and tables should be used only to present information more efficiently than the running text. And all figures and schemes should be assembled in one Microsoft Power point 2003 (or a later version) file. Graphics should have a minimum resolution of 300 dpi. Graphical Abstract. The Graphical abstract represents the contents of your paper and should be expressed as a figure, scheme, or diagram. It should be smaller than 13 cm (length) × 5 cm (height). A sample is provided here Graphical abstract. Supporting Information. Almost any type of supplementary figures or data (detailed experimental procedures, tabulated data, etc.) can be accommodated in Supporting Information. Please prepare the text in a Microsoft Power Point 2003 (or a later version). Others. Nomenclature should be in accordance to the International Union of Pure and Applied Chemistry, the American Chemical Society Committee on Nomenclature, and the Chemical Abstracts Service recommendations. Complicated chemical equations, schemes, and structures should be presented as furnished artwork, ready for reproduction. Mathematical expressions and chemical formulae should be typed, with capital, lower case, and Greek letters easily discernible and identified in the margin so that ambiguities are avoided. Avoid complicated superscripts and subscripts. Use fractional exponents instead of root signs. For papers dealing with X-ray crystallography, crystallographic data (in CIF format) should be deposited with one of the two databases below before publication. Each structure deposited will be given a deposition number (CCDC-…,or CSD-…), and the number should be supplied at the Experimental section with the following standard text: Crystallographic data for the structures reported here have been deposited with CCDC (or FIZ) (Deposition No. CCDC-xxxxxx (1) or CSD-xxxxxx (1)). These data can be obtained free of charge via http://www.ccdc.cam.ac.uk/conts/retrieving. html or from CCDC, 12 Union Road, Cambridge CB2 1EZ, UK, email: deposit@ccdc.cam.ac.uk (or FIZ, D-76344, Eggenstein-Leopoldshafen, Germany, e-mail: crysdata@fizkarlsruhe.de). Manuscript Checklist. Please check your manuscript according to the Checklist before submitting. BKCS publishes four types of articles: Highlights, Communications, Articles and Notes. Highlights are short instructive descriptions of recently achieved important results dealt by a third person. The length of highlight should not exceed two printed pages including short descriptions with essential formula, schemes of figures. Communications report preliminary results whose immediate availability to the scientific community is deemed important and whose topic is timely enough to justify rapid publication. The length of a Communication should not exceed 2 printed pages. A Communication is not preceded by an abstract. Articles should cover the subject matter thoroughly and clearly. They should be concise, avoiding unnecessary historical references. Articles should include an abstract briefly stating the objectives of the study or research, significant results, and major conclusions. The abstract should not exceed 150 words. Notes are shorter reports in full on significant work of a more limited scope. The length of a Note should not exceed 4 printed pages. Notes are not preceded by abstracts. Accounts are written by scientists personally responsible for a larger extent of the research described and are directed to a broad range of scientists who wish to keep abreast of the current research. Most accounts are submitted after invitation by the Editor-in-Chief, but unsolicited manuscripts are also considered. Length of manuscript is guided in the range of 6-10 print pages. Comments include significant remarks on the work of others. The length of a Comment should not exceed 1200 words. Comments are not preceded by abstracts. The editors generally permit the authors of the work being discussed to reply. Author(s) should make the necessary corrections with respect to comments given by reviewers and upload the revised manuscript via the KCSnet Editorial System within a specified time limit provided by the Associate Editor. Manuscripts being not returned within two months after the revision decision will be considered withdrawn. Please include with the revised manuscript a cover letter that explains which changes were made, and write your responses to the reviewers’ comments point-by-point so that the editor can decide whether the responses are appropriate. Please be sure that you retain a copy of your revised manuscript for your record. PDF files of galley proofs and instructions for reviewing the proofs will be sent directly to the corresponding author(s). The corresponding authors should download the proof, make appropriate corrections on the proof, and return it with the other required forms as soon as possible to BKCSproofs@wiley-vch.de. Substantial changes in an article after it has been set in type are made at the author’s expense. The filled reprint form must be returned with the proof, and if a price quotation is required by the author’s organization, such a request should accompany the proof. Reprint shipments may take a month or more after publication. When your manuscript is decided to be published, we will request you to pay for the page charges. Publication of your paper will be postponed until the charges are fully paid. The publication cost for BKCS amounts to $50 per page. Please fill out and sign the page charge form and return it to the BKCS Editorial Office.